Purified human beta 1 preparation from HT1080 fibrosarcoma cell extract. ab30483 is identified as capable of immunoprecipitating a non-reducible alpha subunit from I125 surface labelled Human cell line extract. It is confirmed as specific to the alpha 2 subunit by relative expression of antigen on various cell lines by FACS, and its recognition of affinity purified alpha 2 beta 1 in dot blots. Our Abpromise guarantee covers the use of ab30483 in the following tested applications. IP Use a concentration of 25 - 50 µg/ml. IHC-Fr Use a concentration of 30 - 40 µg/ml. Overlay histogram showing HT1080 cells stained with ab30483 (red line). The cells were fixed with 4% paraformaldehyde (10 min) and then permeabilized with 0.1% PBS-Tween for 20 min. The cells were then incubated in 1x PBS / 10% normal goat serum / 0.3M glycine to block non-specific protein-protein interactions followed by the antibody (ab30483, 0.1μg/1x106 cells) for 30 min at 22°C. The secondary antibody used was a goat anti-mouse Alexa Fluor® 488 (IgG; H+L) (ab150113) at 1/2000 dilution for 30 min at 22°C. Isotype control antibody (black line) was mouse IgG1 [ICIGG1] (ab91353, 1μg/1x106 cells) used under the same conditions. Unlabelled sample (blue line) was also used as a control. Acquisition of >5,000 events were collected using a 20mW Argon ion laser (488nm) and 525/30 bandpass filter. This antibody gave a positive signal in HT1080 cells fixed with 80% methanol (5 min)/permeabilized with 0.1% PBS-Tween for 20 min used under the same conditions. ab30483 stained in A431cells. The cells were fixed with 4% paraformaldehyde (10min) at room temperature and incubated with PBS containing 10% goat serum, 0.3 M glycine, 1% BSA and 0.1% tween for 1 hour at room temperature to permeabilise the cells and block non-specific protein-protein interactions. The cells were then incubated with ab30483 at 5 µg/ml and ab6046 (Rabbit polyclonal to beta tubulin) at 1 ug/ml overnight at +4°C. The secondary antibodies were ab150117 (colored green) used at 1 ug/ml and ab150087 (pseudo-colored red) used at 2 µg/ml for 1 hour at room temperature. DAPI was used to stain the cell nuclei (colored blue) at a concentration of 1.43 µM for 1 hour at room temperature. 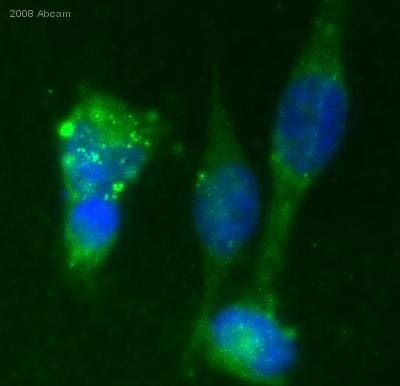 ab30483 staining human breast cancer cells by ICC/IF. Cells were PFA fixed and blocked with 1% serum for 16 hours at 20°C prior to incubating with ab30483 (at 30µg/ml) for 16 hours at 4°C. 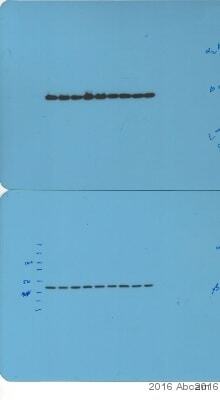 An Alexa Fluor® 488 conjugated goat anti-mouse antibody, diluted 1/200, was used as the secondary. Publishing research using ab30483? Please let us know so that we can cite the reference in this datasheet. We used Heat mediated retrieval at pH 9. The dilution of the antibody was 1/50, 1/100 and 1/200. Room temperature incubation for 30 minutes, with a polymer based detection. And then overnight at4C with the polymer based detection. This is our routine IHC staining protocol for all clinical work. So this is where I started. There is staining but the pathologist feels that it is non specific. The data sheet lists Breast CA as a control, but what type of breast cancer. The pathologist also said that itshould stain basement membrane in normal epidermis....this is what we could not get good staining with. Based on what you have already tested, I am not sure there are many more steps to be optimized. One consideration would be to extend the primary antibody incubation to overnight at 4oC. Longer incubation with less antibody tends to result in a cleaner, more specific signal. I am also happy to send out a new vial of antibody or issue a credit if you would prefer. What exactly is this detecting, which specific protein has been used as an immunogen?. Will it definately detect the alpha 2 integrin? Please also provide the ELISA testing protocol.. Thank you once again for your telephone enquiry. I am sorry to confirm that this antibody has been tested externally in ELISA and regrettably we have no further details to provide on the protocol on this occasion. We aim to provide as much information as possible to customers, and I amsincerely sorry we have no more information to send. I am sorry I am not able to confirm much further detail regarding the immunogen for ab30483 Anti-Integrin alpha 2+beta 1 antibodyas this particular product has been sourced externally. However, I can confirm that in testing it is capable of immunoprecipitating a non-reducible alpha subunit from I125 surface labeled Human cell line extract. It is confirmed as specific to the alpha 2 subunit by relative expression of antigen on various cell lines by FACS, and its recognition of affinity purified alpha 2 beta 1 in dot blots. I am currently waiting for further detailsregarding the ELISA testing and will contact you again with more information once I have it. I hope this information will be helpful to you and thank youfor your patience. if you have any further questions, please do not hesitate to contact us. I just wanted to give an update on how it is going with the Integrin alpha2beta1 staining in the human skin biopsies here at. After developing the protocol even further I have reached a point where I usually use 1:80 of anti-Integrin and 1:400 for the secondary antibody, and only boil for 5 minutes for the antigen-retrievel. And I am wondering if I might have an uneven antigen-retrievel? Sometimes groups of keratinocytes are stronger stained than surrounding ones. Whatever feed-back you can give would be useful! Thank you for getting back to me with an update of your progress. I have gone back and had a look at the previous results of your colleague. There definitely seems to be some staining of fibroblasts (in the boiled sample). As you say, it may be a case of optimising the antigen retrieval. It seems that the epitope recognised by this antibody is quite sensitive to fixation and the subsequent retrieval seems important. It may be worthwhile trying a few different conditions in order to obtain the optimim staining. As can be seen from the slide I have attached to this email, different targets and tissue preparationshave different optimum conditions which need to be evaluated. This in contrast to the antibody which you are using which is only able to detect one epitope of the integrin alpha 2+beta1. They have also used frozen sectionswhich is able to preserve thetarget proteinin a different way to how PFAfixationaffects thetissue. One thing I would suggest may be worth trying now that the non-specific staining has improved is to remove the Tween (or any other detergent from the buffers used) as this will act to permiabilise the cells andpotentially this may bealtering thethe presentation of this membrane protein. I hope these suggestions have been of help.If you have any further questions please do not hesitate to contact us again. 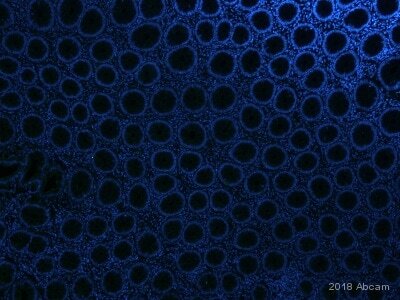 Attached is a picture taken a few years ago by a colleague of mine using Mouse anti-human a2b1. The software for the microscope is not collaborating today, so I cannot send you any pictures from my latest run. The difference being that I –did- get staining in my control, as my colleague did not as you can see in the picture of the IgG control. I do think that the secondary antibody might be causing the non-specific staining so I have contacted Invitrogen as well. 1. What should be the localization of the staining in human skin biopsies using Mouse anti-human a2b1? Should the kertinocytes be stained and, thereby, the staining is correct as in the attached image? 2. Are there any known non-specific staining of this antibody in human skin biopsies? Thank you so much and let me know if you need any other information. Thank you for providing that information. It has helped greatly in understanding what you have been observing. And the following reference has also commented that the integrin isfound in the keratinocytes in the basal layeras well as other regions of the epidermis when wound repairand/or psoriasis is involved. I therefore think the staining you have been seeing is what might be expected. There are however a few points in your protocol that I have noticed which may be adding to the non-specificity you have seen with the secondary antibody. Could you confirm, was the secondary which you used the same as what your colleague used to produce the staining you sent to me? 1. The length of time used for antigen retrieval seems quite long to me. We usually recommend trying 5, 10 and 15 minutes boilingto see which performs the best. I am however unsure of what the "reveal decloacker" is and it may be best to follow the instructions they have provided with it. Over doing the antigen retrieval can however lead to non-specificity and may be worth optimising. 2. You are using quite high concentrations of the antibody. Are you seeing good staining with 1/160 dilution? I would suggest trying the antibody at an evenhigher dilution, 1/250 and 1/500 and see if you still observe good staining. The dilution of the secondary antibody could probably also be increased, maybe try 1/500 and 1/1000 to reduce the non-specificity(but Invitrogen may be best placed to advise you on this). 3. I don't know what buffer you are using to perform these experiments but I would suggest using TBS (as it tends to give cleaner signals than PBS) with 0.1 %Tween added. This can reduce the surface tension allowing the reagents to cover the tissue evenly as well as reducing non-specific binding. 4. Is the secondary pre-adsorbed? If you are still having problems of non-specificity with the secondary after trying the optimisation tips it may be worth trying an antibody which has been pre-adsorbed. This process involves the secondary antibody being passed through a gel containing immobilized serum proteins from potentially cross-reactive species. The resulting purified antibody is more pure and specific, significantly reducing cross reactivity.An antibody such ashttps://www.abcam.com/Goat-polyclonal-Secondary-Antibody-to-Mouse-IgG1-heavy-chain-FITC-pre-adsorbed-ab98692.htmlmay be appropriate for the experiment you are performing. I hope this information has been of helpand look forward to your reply.